The Birth of Griffiths III . This short presentation gives an overview of the contents of Griffiths III with an update on further statistical work, translations, validations and publishing distributors worldwide. If you are located in Australia, South Africa, Israel, Portugal, Italy or Sweden/Norway, please contact the Publishing distributors listed here. Foundations of learning – assesses critical aspects of learning during the early childhood years. Language and communication – measures overall language development, including expressive language, receptive language, and (to a lesser extent) use of language to communicate socially with others. Eye and hand coordination – considers fine motor skills, manual dexterity and visual perception skills. Personal-social-emotional – measures constructs relating to the child’s developing sense of self and growing independence, interactions with others, plus many aspects of emotional development. Gross motor – assesses postural control, balance and gross body coordination, among other abilities. How do I use Griffiths III? Griffiths III can be used by psychologists and paediatricians used for a variety of purposes in a range of applied settings. Assessing a child’s developmental profile and level helps to identify if a child is developing appropriately for their age or whether difficulties in specific areas could be linked to a specific developmental or learning disorder. Griffiths III can assist in tracking and monitoring development over time, and planning for and measuring the impact of interventions. It can also provide valuable information to inform decisions about future placement and management of the child. What’s new to Griffiths III? Griffiths III has taken the best from the previous editions and built upon it to become a substantially new and improved kit. 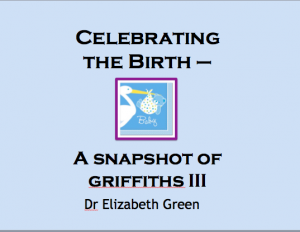 More than 80% of Griffiths III has been redesigned to make a modern assessment in line with the latest developmental, paediatric, psychological and neurological research. Clinician feedback has also been taken into account, and the administration sequence has been streamlined so as to be straightforward and practical for users. The time required to complete the Griffiths III is approximately 60 minutes. All equipment can be easily cleaned, is child-friendly and has been designed to keep small children engaged and at ease. The differences between the GMDS-ER and the new Griffiths III represent an evolution in developmental assessment based on the latest research and theory, and building on the best of the past. Wechsler (1958) articulated that observing individuals while they solve problems provides an opportunity to gather qualitative, clinical information. This followed in the tradition of the Method Clinique, developed by pioneers such as Jean Piaget and Ruth Griffiths (1954), who observed children at play and in solving problems within their environment. Not only did this ecological systems approach predate Bronfenbrenner (1979), it is reflected in the new protocols where more space has been allocated for observations which may be quantified in terms of samples of behaviour and language. In addition, more advanced protocols will be developed to augment the clinician’s observations and analysis. The new Griffiths III also reflects the cumulative, quantifiable feedback from clinicians in the field, advances in statistical analysis and norming and research into children’s development (from the neurodevelopmental to emotional regulation and play). But the Griffiths III also represents a significant development; more than 80 percent of the Griffiths III has been redesigned. It is more streamlined, in terms of ease of administration (fewer disparate items, many of which have been integrated into the ‘Quiet Book’), reduced in terms of the number of items (by 36%) and the age range to be evaluated (birth to 5 years 11 months), modernised in terms of the stimulus materials and more integrated in terms of the norms structure and use of protocols. The administrative sequence has been made straightforward. Moreover, the materials can be cleaned. There will not be separate norms for the 0 to 2 year-old cohort and another for the 2+ year cohorts in the Griffiths III so it will constitute a seamless assessment. In addition, the new norms will address the ‘Flynn effect’ and minimise cultural bias. At the same time the age format structure will be reintroduced from earlier versions. Moreover, the domains of assessment have been reduced from 6 to 5. The Foundations of Learning Subscale (A) has replaced the Performance and Practical Reasoning Subscales of theGMDS-ER. It will evaluate various aspects of cognition such as different types of attention, processing speed, aspects of executive function such as flexibility, dimensions of reasoning, curiosity and creativity, organising information and planning solutions, concept formation and sequencing thought (Stroud, 2016). It also incorporates various aspects of visual and auditory long-term and short-term memory as well as play (Stroud, 2016), a by-product of cognitive, social and emotional development. Further, it taps visual sequencing in the Picture Arrangement and Series sub-tests. The Language and Communication Subscale(B) has been refined so that differences between expressive and receptive Language on the one hand and syntactic, semantic and pragmatic language (Paradice, 2016) on the other have been made more explicit and amenable to further consideration. Memory has also been incorporated into the Scale. In conjunction with the Personal, Social Emotional Scale (Subscale D), it will provide useful information in the differential diagnosis of certain neurodevelopmental disorders. The Eye and Hand Coordination Subscale (C) has been restructured so that it is more contemporary and fun to use by children and in line with the latest research on neuro-physical development (Forssberg, 1998). New tasks include putting rings on a pole (a prelude and form of scaffolding for bead threading), using playdough to make shapes (which also provides information on tactile sensitivities), using Connector Blocks to evaluate strength, imitating finger movements and using their index finger to track ‘trails’ and employing ‘Construction type pieces’ to construct 3 dimensional objects and tap bilateral asymmetric coordination (Bloomfield, 2016). The Personal, Social Emotional Subscale (D) has undergone a major revision. It breaks personal-social-emotional development into a finer grained analysis so that it transcends mere audits of adaptive behaviour. It measures the capacity to ‘read’ facial expressions’, empathy, ‘theory of mind’ and ‘perspective taking’, self-concept and capacity for self-evaluation at the 5 year 11 month old level and moral reasoning (Lane, 2016). The Gross Motor Subscale (E) has been modernised, safety has been accentuated and the new constructs of Postural Development and Motor Sequencing have been incorporated in the new scale (Green, 2016). Overall, the new Griffiths III represents, conceptually, a significant advance in developmental assessment which can be used with a range of populations and contribute in a practical way to the learning plans of those in need. In the final analysis, assessment and diagnosis is dependent on the clinician’s and researcher’s capacity to carry out a comprehensive investigation, where data is collected from many sources (including using assessment tools), various hypotheses explored and the professional’s nuanced clinical skills and judgement are used to maximise the intervention outcomes for the child, the family, and other institutions, such as schools. Its strength is that it is a reliable tool that has, and continues to, yield efficacious results with special populations from birth to 5 years 11 months of age and informs interventions in the form of Individual Educational Plans (IEPs). Bloomfield, S. (2016). Subscale C: Eye and Hand Coordination. 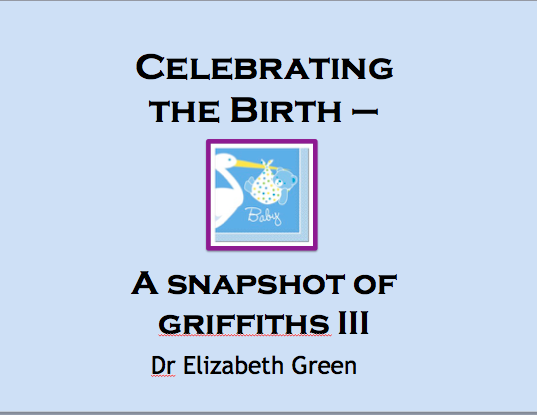 PowerPoint Presentation on the developments in theGriffiths III on the ARICD site. Flynn, J. R. (2009). What is intelligence: Beyond the Flynn Effect (expanded paperback ed. Cambridge University Press: (The term was originally coined by Herrnstein and Murray). Green, E. (2016). Subscale E: Gross Motor. PowerPoint Presentation on the developments in the Griffiths III on the ARICD site. Griffiths, R. (1935). Imagination in early childhood. London: Routledge. Griffiths, R. (1954). The abilities of babies, 0–2 years. London: University of London Press. Lane, H. (2016). Subscale D: Personal, Social, Emotional. PowerPoint Presentation on the developments in theGriffiths III on the ARICD site. Paradice, R. (2016). Scale B: Language and Communication. PowerPoint Presentation on the developments in theGriffiths III on the ARICD site. Stroud, L. (2016). Scale A: Foundations of Learning. PowerPoint Presentation on the developments in the Griffiths IIIon the ARICD site. Wechsler, D. (1958). The measurement and appraisal of adult intelligence (4th ed.). Baltimore, MD: Williams & Witkins. For payments, membership, and comments or suggestions about the website, contact web@aricd.ac.uk.